The lastest 2000 AD Audio Prog from Big Finish, number 8 in the series, is out now, entitled JUDGE DREDD - I ♥ Judge Dredd. 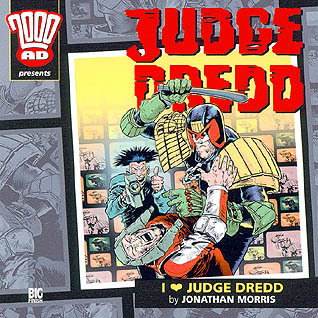 "I ♥ Judge Dredd - a bonanza celebration of Mega-City One's premier lawman! Join your host, TV's Tark Pastry, as he accompanies Dredd on two eventful and action-packed days in the Big Meg. Gain an intimate, never-before-seen insight into the man behind the helmet. Discover what really makes Dredd tick. I ♥ Judge Dredd also features contributions from civil rights campaigner Pert Mitchell, former gameshow host Brucie Squires, mineral water magnate Frisco Lambada and hardened criminal mastermind Harry 'The Hat' McGuiness, plus special cameo appearances from pop sensations the Grim Utter Death and Radish Timberlake, leader of the revolutionary collective known only as the 'Karma Vigilantes'. Plus, of course, our very special guest - 'Old Stony Face' himself! The one, the only… Judge Dredd!" I ♥ Judge Dredd will be available from the Future Shop at www.2000adonline.com very shortly.